How do you decide between two non-obvious choices? Long answer, let me explain. Some of the most difficult decisions you can make in life are when you have to choose between 2 less than ideal scenarios. That’s just off the top of my head. I’m sure you can think of more. But, this kind of thinking is actually a trap. It happens when you get so focused on your current reality, that you forget there are more possibilities. Have you ever hear of one-itis? That’s the name given to you when you become overly focused on one opportunity. If you have a crush on someone and you think that one person will be the only person to make you happy. That’s one-itis. Deciding between two less than ideal options is two-itis. So what do you do when you’re trapped in the midst of a decision and it feels like there is no good way out? Step 1: Stop weighing the pros and cons of each decision. Look, you’re a sensible person, and as such, you know it’s important to consider the potential consequences of every action. Except the universe doesn’t work that way. When you go back and forth between two different options, thinking that it must be one or the other, you’re practicing vibrations of confusion, doubt, and struggle. One evening, a friend of mine wanted to buy a truck. She had searched out and found two potentially good candidates, but she was stuck trying to figure out which one to buy. One of them was too expensive for her liking, but close by. Another was a better deal, but was a 3 hour drive to even look at. Neither of them were exactly the truck that she wanted in the first place. So, she went back and forth for hours thinking through every little aspect of every part of the decision. After all, this was a BIG DECISION. Buying this truck would take most of the money she had. The next morning, she hadn’t made any headway. She was still stuck examining the pros and cons. She didn’t have a truck and she certainly wasn’t happy. I’m not saying that you shouldn’t think about what you purchase. Instead, this illustrates that it’s important to see the pattern that created analysis paralysis. It’s easy to get stuck in two-itis, because every step towards the trap makes sense. You find two options that are close to what you want. Neither are exactly what you want, so you do the logical thing and compare the two against each other. But, because neither is really what you want, you bounce back and forth believing that the process of comparing them will give you what you want. But, in fact, it can’t. The universe only gives you what you want when you practice the vibration of having what you want. And you can’t practice the vibration of what you want while you’re deciding on how to compromise on getting it. So, when do you back out? When you’re not feeling good anymore. Part 2: Back off of the subject for now. This doesn’t mean that you won’t get what you want. But, you can’t get the option that works best for you while you’re cutting off your alignment to the energy of the universe. You’re stuck in this decision because you didn’t stay with the good feeling that led you to wanting what you wanted in the first place. It happens. But you can’t get through this process to what you want. Backing off just means that you let go of needing to make a decision on this right now. This will allow you to get to step three. “If I don’t make this decision this minute, will there be any life changing consequences now?” It’s important to use the word, “now”, because if you have time to think about the pros and cons, then you have time to wait and come back to this later. You can’t possibly answer yes to this question. 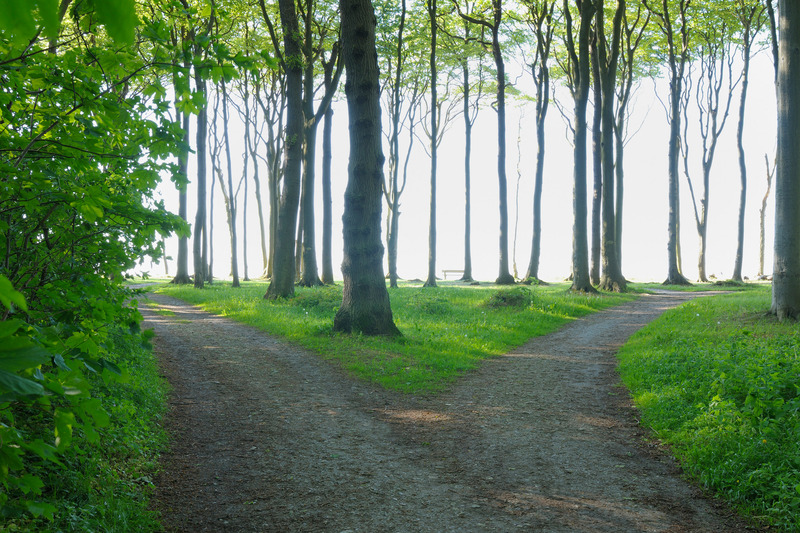 “Are these the only two decisions that are possible for me?” This will help you recognize that there might be other choices that you aren’t aware of at this moment. My friend with the truck could have bought any number of other trucks, bought no trucks, eaten an ice cream smoothie, etc. She had tons of other options. “What would I rather be doing?” If you’ve been at this for a while, there’s plenty of other thoughts that have come to your mind. So, just know that you can do something else. And if you feel moved, do it for just 5 minutes before coming back to your decision. Part 3: Focus on what you want. Ah, the LOA bread and butter. On the subject of a seemingly impossible decision like this, know that it’s not about the decision. It’s what the decision represents to you. It’s likely that the decision represents the emotions of compromise, struggle, and frustration. A fork in the road like this happens when you’re not clearly practicing the vibration of what you want. You didn’t start out this process wanting to struggle, so in order to get back into your flow, focus on why you got into this decision making process in the first place. What’s so important to you that you’re willing to focus for hours on what method you should choose to get there? For my truck friend, she wanted freedom. She wanted to take her truck to Burning man and to be able to travel around and see friends. She wanted independence and autonomy. None of these kinds of emotions or passion were reflected in trying to decide between two trucks. So, don’t worry about your decision for now. Instead, think about what you want and focus on that. Only do this after you’ve taken a break from making your decision otherwise you’ll get sucked back into the terrible choice. Friendly reminder: The universe is infinite and has the ability to give you exactly what you want. So next time, you’ll be able to notice this phenomenon happening and recognize it for the shell game that it is. Being sensible is sometimes not about being sensible. If you like these tips, sign up for my newsletter. As my thanks, you’ll get a free preview of the Law of Attraction Instruction Manual as well as all future free books of mine. Yes, I want to get more vibration raising thoughts in my inbox.